December 2013 was a busy month for us in Madeira. On 5th December a huge storm caused immense damage to most of the Marina’s on the south coast. Some of the smaller Marinas were totally destroyed, and boats of all shapes and sizes suffered huge losses. We were extremely thankful that Red Ruth escaped any damage. However the Marina was so badly damaged that we needed to haul out into the yard for the remainder of the winter. Repairs to the Marina were expected to be complete by the end of March 2014, but it would take some years for the smaller municipal marinas to be repaired. Sadly we also said goodbye to our best friend DogDog who suddenly took ill early in December and despite the best efforts of the vets and all the care and love we could gave him he lost his battle. We are extremely sad to be without him and will always remember him. Christmas 2013 was spent in Santo da Serra with our friends in Madeira. The day was bright and sunny so we enjoyed our pre-lunch drinks outside in the garden. The turkey was cooking in the kettle BBQ with the potatoes and veg cooking in the other BBQ. The kitchen was a hive of activity but all the heat was outside! Everyone brought something along and as there were 11 of us at the table it meant that no-one was in the kitchen for too long. Boxing Day (or St Stephens Day) started with a ‘crazy golf’ challenge in the park at Santo da Serra. We all met up for a glass of bubbly before hitting the course. It was a serious game with another glass of bubbly and some lovely chocolates at the interval. During the second round the boys played some good shots but the girls had the upper hand and putted into the lead to win one shot ahead. pic: They thought it was the winning shot! We retired to the O’Briens for the evening and enjoyed a lovely meal followed by a chance for the boys to redeem themselves in the Boxing Day quiz. The quiz master did a great job but I’m afraid to say that we were not able to let go of the winning streak so the day ended on a 2-0 win to the girls! New Year’s Eve in Madeira is a spectacle not to be missed. The firework display surrounds Funchal bay with displays from sea level to about 200 metres up the mountain. The choreography is amazing and at midnight the skies light up. It’s like being a child in the biggest sweet shop in the world – you just don’t know where to look next and everything is so wonderful. The event has been entered in the Guinness Book of World Records (2012 I think) and is so popular that Cruise Ships sail to Funchal just for the few hours that the event lasts. We counted 14 anchored up in the bay. We had been invited to friends, who live on the east side of Funchal, for dinner and to watch the fireworks. We had a lovely meal with a splendid view of all the activities. I’d recommend a visit to the Island for anyone wanting something a bit different (and a bit warmer) this year. Lorraine had a brief visit back to UK in January and on her return (with haggis and neeps) we held a Burn's Supper. For some it was their first (and possibly the last!). Whilst based on the traditional Burns Supper it was 'adjusted' slightly into an interactive evening - everyone had a part to play (or a scottish accent to try). 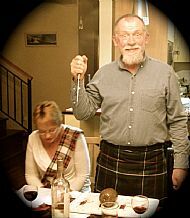 The 'Laird of the Manor' did his duty and 'Toasted the Haggis', whilst sporting traditional dress (the Kilt). March came and went with no sign of any repairs to the marina. We didn’t have much work to do on Red Ruth as she had been out the water the previous winter, at least that’s what we thought! As always with yachts, there is usually something! One morning when we arrived at the yard we were greeted by a trail of oil from the bow thruster, down the hull and along the concrete floor of the yard. The seals had gone in the bow thruster and required replacing. Of course, it wouldn’t come apart easily and of course the spares had to be brought in from UK! March did bring on the start of the local sailing events and, after an introduction from the Marina manager, Peter found himself crewing on some of the local boats. This was most welcome as Red Ruth was still on the hard.They even had a couple of first places. 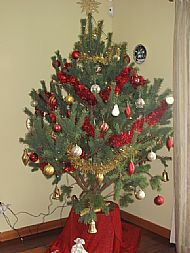 Sometime over the festive period our chats led on to what everyone was doing for holidays this year. We hadn’t planned anything and as our friends were returning to Ireland to have a big birthday celebration and had extended an invite to us, we put together an Ireland/Scotland trip for the four of us in mid-April. We arrived in Dublin to a slightly cooler temperature to that in Madeira but the week turned out bright and sunny days, showing us Ireland at its best with visits to Glendalough, Inishboffin, Galloway and Dublin. 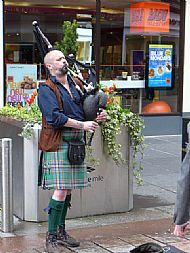 Then it was off to Scotland for a week taking in Loch Lomond, Loch Ness, Glencoe, Skye and Orkney. Now that May is here we are all on reduced intakes of food and drink in an attempt to fit back into our summer clothes. Red Ruth is back in the water and safely berthed at the Marina. A new coat of antifoul has been put on and she now sports a fine black keel with a grey boot line. It looks really smart with the red topsides. Repairs still need to be done to the Marina but there are secure berths available. This month was the MEO regatta, in which we had participated last year. Our entry was in, crew lined up, Red Ruth dressed for the occasion and off we went. The start line was just outside Santa Cruz with the course taking us toward Quinta do Lorde for the first mark to starboard. The wind was expected to be around 20 knots during the sail so we decided to put a reef in the main. Our start was lined up to be one of our best yet until one of the local yachts needed to veer to port in an evasive move. Unfortunately this was straight onto a collosion course with ourselves and, with what felt like an inch to spare, we also needed to veer to port to avoid being T-boned. After taking the mark at Quinta do Lorde we headed out toward the mark at the Desertas Islands. Once out of the lea of San Lourenco peninsula the swell grew along with the wind. It was a good sail with our course taking us almost right to the mark, which we took with our nearest competitor chasing us and closing. The run back to the finish line was a heavy weather event with winds reaching 35 knots and a good 3 metre swell at times. It was hard work keeping the boat on course and after a second reef in the foresail the handling was a bit easier. We rounded the finish line, dropped the sails and headed back to Quinta do Lorde Marina. The wind got up to around 38 knots, the swell was much reduced but in the short distance we all managed to get totally drenched!! After a good hose down and tidy up we all went to our respective homes for a hot shower before heading into Funchal for the prize giving. The photographer always takes excellent photo's of the event and we were pleased to see some wonderful action shots of Red Ruth. Our final result was 7th overall (out of 9) and 2nd in class (out of 3). We had a great day and our thanks to the wonderful crew that joined us. 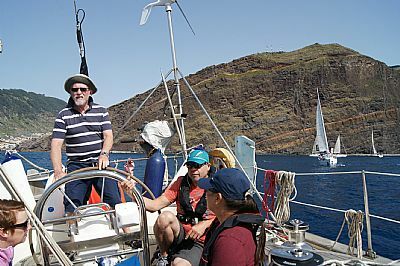 Mid July kept us busy with local sailing events in Madeira. The yacht and her sails were measured for a local handicap which means that we can now be competitive in Class, rather than participating in the Open Class. 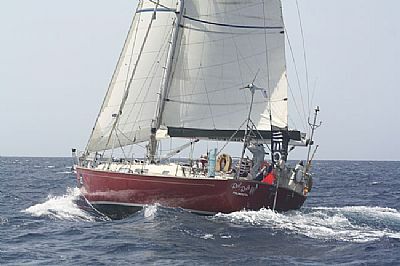 A 'first in class' was taken in the Santa Cruz Regatta after some 'tactical' sailing which enabled Red Ruth to take advantage of the little wind there was as the finish approached. pic: Pleased with the results! August brought an entry into the Madeira to Porto Santo race - an overnight race from Santa Cruz to Porto Santo, followed by a race in the bay the next day and a race back to Madeira on the 3rd day. 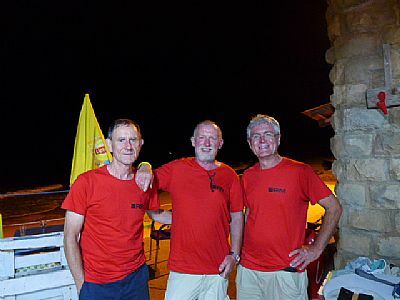 The 'boys' set out as planned on the Thursday evening however the conditions were not very pleasant with some large seas causing some 'Mal de Mer'. The duties, including sleep, were shared as usual until around 4am when the Skipper went below to visit the heads. On the way down the companionway the boat fell off a wave causing Peter to go one way and the boat the other. The resultant fall off the steps and the outcome of two moving objects in collision meant that for the next 2 hours the skipper had to suffer severe pain. On reaching Porto Santo he was taken to the Emergency Room and declared to be suffering from a broken clavicle. Despite this, additional crew was found and the race in the bay the following day was completed. 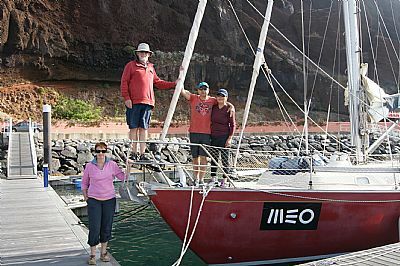 pic: Skipper and crew in Porto Santo. During the next few days, and after some further x-rays, we found out that Peter also has some broken ribs and a broken bone in his hand. I'm afraid Red Ruth suffered some damage as well with a broken handle on the oven door! So for the next couple of months we won't be doing any sailing and our participation in the Canaries to Madeira race planned for 9th September will have to wait for 2016 now. 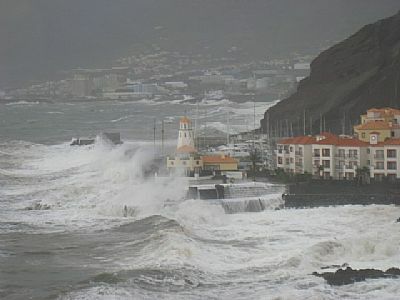 Never mind, the weather is great in Madeira and we have had some good friends visiting. Ocean Cruising Club visited Qunita de Lorde Marina whilst on passage with their East Atlantic Rally. Peter was invited to participate in the organisation of some of the on-shore activities during their weeks visit. A 'Best-Dressed' boat competition was held. 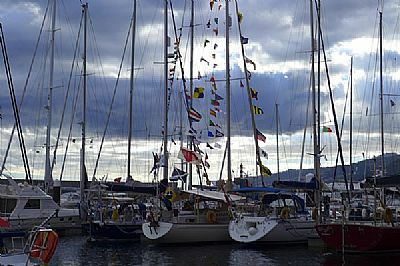 The next event in the Marina was the arrival of the Transquadra yachts en route from France to Martinique. This Rally stops in Madeira to over-winter before returning in January to head off toward their final destination. Another week of festivities was held, and again Peter was invitied to participate in the on-shore activities. In the last few days of November a return appointment with the Orthopaedic Consultant gave Peter the good news that he could take off his shoulder brace. Bones have healed! Work now starts on rebuilding strength in the muscle - its going to take a while. A few odd jobs on Red Ruth need to be completed now that he can get on and off the yacht. The oven door handle has been repaired and just needs fitted, a new hawk has arrived and awaits mounting at the top of the mast. The weather for the past three weeks has been extremely windy so the thought of going up the mast certainly didn't appeal! With only two weeks to Christmas we have started doing the present shopping and card writing. We would like to wish all our followers and readers a very Merry Christmas and hope that the Festive Season brings you all good things.